This yummy dish is packed with tons of flavor!! This was a spin off of my moms recipe for stuffed bell peppers and it turned out fantastic!! Gotta give this one a try!! Additional tomato sauce, Parmesan cheese, and fresh basil for serving. Preheat oven to 350°F and spread tomato sauce evenly across bottom of large baking dish. Set aside. Heat olive oil in a large skillet over medium-high heat. Add onion and cook, stirring occasionally, until soft, approximately 4-5 minutes. Add sliced mushrooms to skillet and sauté, stirring continually, until they start to brown and release their liquid, approximately 4-5 minutes. 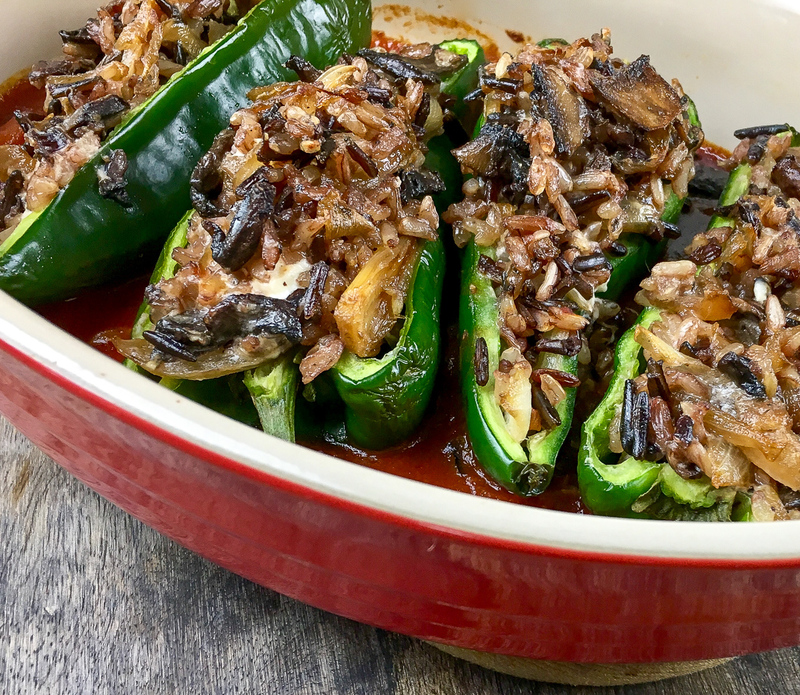 Reduce heat to medium and add cooked wild rice, cream cheese, goat cheese, and ¼ cup Parmesan cheese to skillet and stir until cheese is melted and the rice and mushrooms are thoroughly coated. Season with salt and black pepper, to taste. 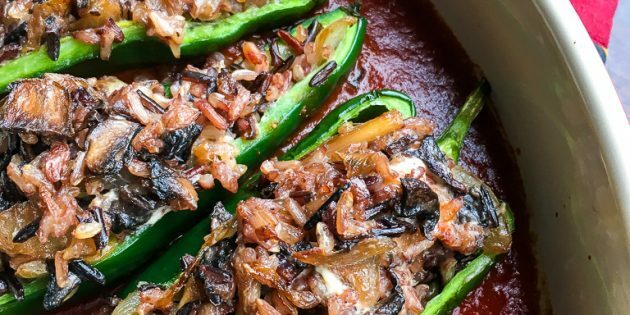 Spoon rice and mushroom mixture into empty Poblano pepper halves and arrange in prepared baking dish. Sprinkle remaining Parmesan cheese on top of each pepper half. For this recipe I used my Le Creuest Skillet to saute the onions and mushrooms and make the stuffing for the peppers. The Le Creuset skillet is one of my favorite dishes in my kitchen and works perfectly for all kinds of recipes. The best part about this cast iron skillet is its a little easier to maintain then other cast iron skillets I have used just make sure to follow manufactures instructions on the care your your skillet. Click on the link or picture to check it out!! For a built to last casserole dish you need to try the Emile Henry baking dish!! Something I really love about this dish is the size of it, its deeper than most standard baking dishes so I can fit more into the pan. The handles are a nice size and make it easier to slide in and out of the oven even while wearing oven mits. This pan is super easy to clean as well! This baking dish is a little expensive but you get what you pay for and I think its worth every penny!! Click on the link or picture to try it out! !